Duo Dalriada - Neil Drover - agency for live music, presenters and entertainers. Duo Dalriada professional flute and harp duo based in Glasgow. 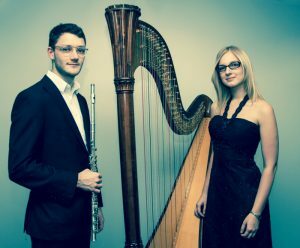 Established in 2013 at the Royal Conservatoire of Scotland, Duo Dalriada is experienced in performing at concerts, weddings, private and corporate events. Duo Dalriada provides a bespoke experience to make your occasion unique and tailored to your own requirements and tastes. Our core repertoire offers a broad range of elegant music covering a variety of styles and can be adapted for all types of occasions and we are happy to advise or help with selection of music as well as meet any special requests. Alasdair has been performing and studying flute for 15 years. Having graduated from The Guildhall School of Music and Drama, London, in 2013 with a 1st Class Honours Degree in flute, Alasdair is now concluding an MA in music at the Royal Conservatoire of Scotland. Alasdair enjoys a broad career as a professional flautist and has recently completed orchestral apprenticeships with the Royal Scottish National Orchestra and the BBC Scottish Symphony Orchestra, both in partnership with the RCS. Recent performances include orchestral concerts with the Royal Northern Sinfonia, musical theatre productions, opera and solo performances. Alasdair was previously a member of Quintessence, providing performances at corporate events for the City of London Corporation from 2011-13. Ewelina is a Polish harpist based in Glasgow. Having graduated from the Royal Conservatoire of Scotland with a BMus with Honours in 2014,. Ewelina has been an awardee of the RCS Scholarship Trust for the last four years. She undertook an apprenticeship with Scottish Opera during which time she participated in two major projects – the production of Britten’s Midsummer Night’s Dream and The Wagner and Verdi Gala in Glasgow City Halls. Ewelina performed in Young Artist-in-Residence Maciej Granat’s project ‘Germaine Tailleferre Anniversary Concert’ presenting Tailleferre’s Concertino for Harp and Orchestra. Ewelina is a dedicated orchestral and chamber musician. Her recent performances include the Hogmanay Gala Concert at the Glasgow Royal Concert Hall and a collaboration project between Nicola Benedetti and the RCS session orchestra. Ewelina has also been invited to perform with various orchestras and choirs in the UK. To name a few: the Scottish Festival Orchestra, the Scottish Bach Players, Glasgow Chamber Orchestra, Strathclyde University Orchestra, Amicus Orchestra , Cumbria Rural Choirs in Penrith and the Cowal Choral Club in Dunoon. As a chamber musician she has built a broad experience playing in small ensembles, duos, trios, and a harp quartet.